Due to insistent public demand, the MTBO Bible Run has been moved to MARCH 3, 2012, SATURDAY. Sign up now and be part of history! May They Be One Bible Campaign - Help Put a Bible in Every Home. "I pray that they may all be one. Father! May they be in us, just as you are in me and I am in you. May they be one, so that the world will believe you sent me." Would you like to be part of history and help change the course of our nation? If so, we invite you to take part in a historic undertaking billed the May They Be One Bible Run. A run like no other, this event will bring the different sectors of society and various faith persuasions to run in UNITY for one cause— to bring God’s Word and message of hope to the Filipino people. 5 million Bibles to 5 million poor Filipino families in 7 years. 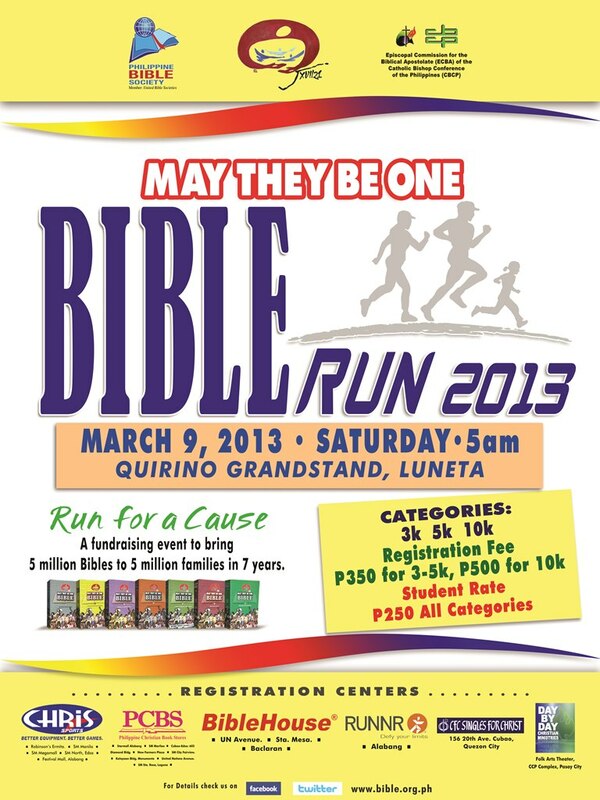 For further details contact the MTBO Bible Run Secretariat at 524-5337 or 526-7777 loc. 631 & 633.